The manufacturing renaissance at the base of this supposed US economic is disappearing. It is unsurprising, quite predictable actually. First, there was the cleanup from last year’s major storms and then frontrunning potential trade restrictions. Manufacturers domestically were gearing up for a whole host of non-economic reasons. If Keynes had ever been right about activity for the sake of activity, it would have shown up here. Instead, after twelve months of favorable comparisons economic accounts are once more coming back down to the pitiful baseline economic state. The latest is durable goods. 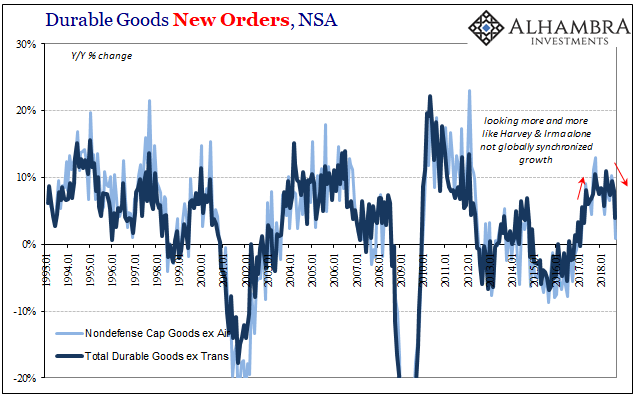 In September 2018, according to the Census Bureau, new orders for long-lasting goods rose just 3.9% (unadjusted) year-over-year, the lowest gain since April 2017. Over the twelve months prior to September new orders had averaged more than 8% growth. 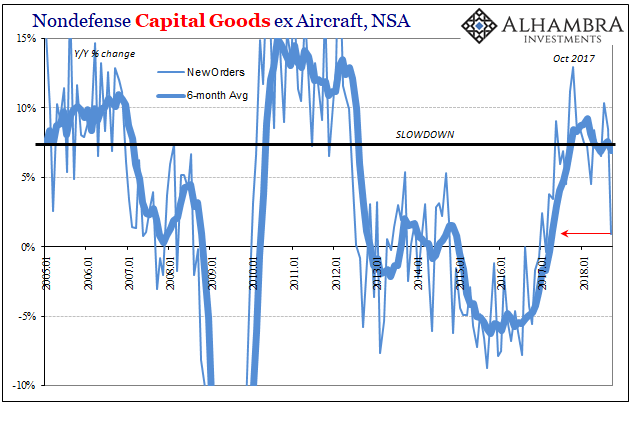 In terms of capital goods, this reversion to form is even more dramatic. New orders for capital goods had likewise averaged more than 8% from September 2017 to August 2018. Last month, however, orders were nearly unchanged, rising by just 0.9%. What matters most is the more recent results. For those we turn to the seasonally-adjusted series. Manufacturing activity in this segment appears robust but only in those discrete periods – the three months after Harvey and then for three months leading up to the trade war stuff. 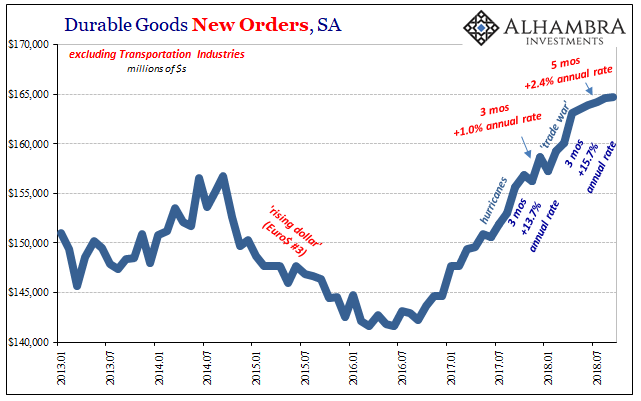 In the five months since, however, durable goods orders are growing at a pitiful 2.4% rate. At such a low level, it’s now difficult to distinguish between coming back down to the prior trend and the possible condition of rolling over into the next downturn. This analysis is complicated further by that second three-month period in early 2018 when activity was almost certainly pulled forward ahead of trade restrictions. Therefore, we are left wondering what that 2.4% annual rate really suggests, and it could be a combination of all three: demand pulled forward, a sluggish economy underneath all-the-while, and that weakness contributing to the same possible economic rollover already appearing elsewhere around the world. Along those lines, more troubling news out of Germany yesterday. The ZEW sentiment survey had already suggested deepening concerns, and now the IFO’s review of the German situation corroborates the deterioration. Firms were less satisfied with their current business situation and less optimistic about the months ahead. Growing global uncertainty is increasingly taking its toll on the German economy. From Canada to Brazil and China, it isn’t looking good. And central bankers will, true to form, continue undeterred by any of it. The Bank of Canada not only raised its benchmark policy rate yesterday, it signaled its readiness to become more aggressive so as to get ahead of forecast overheating despite a clear slowdown in 2018. In Europe, Mario Draghi noted yesterday, “incoming information, [is] somewhat weaker than expected” but he assured everyone you better believe that won’t stop policy normalization. And Jay Powell is, of course, the hawkiest of hawks even if he can’t figure out federal funds (still equal to IOER, by the way). None of them seem capable of noticing the common thread running through all these places, the US most definitely included (just look at the housing market). The world was synchronized, supposedly, last year for good. This year, it’s still synchronized but more and more the wrong way. It might be surprising if it wasn’t the fourth time.